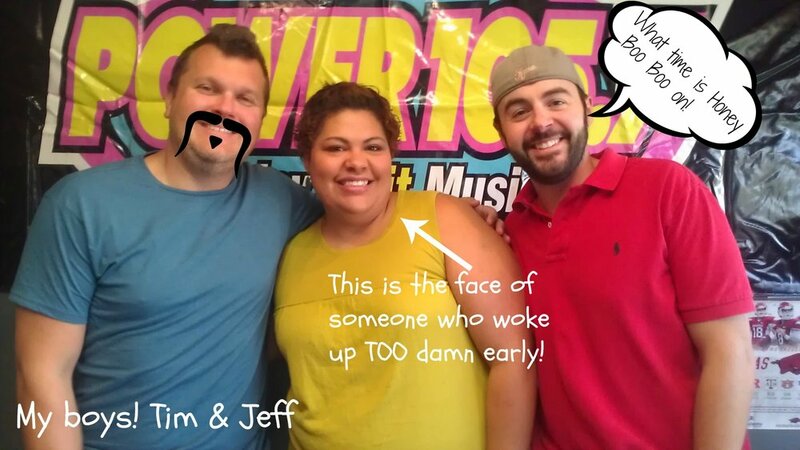 Tim & Jeff, Power 105.7, and The Raddest Morning Shower Ever. I have a secret love of radio DJ's, y'all. It is a thing for me. When I lived in Tulsa, and listened to Christian music, I always called in to talk to Brent from KXOJ. I would call and complain about how they needed to play better music (irony) and cut up with him. THEN one day Brent became the youth pastor of our church, in a sudden career change, and I was all, "Pst! We have a DJ for a youth pastor, how am I the *only* one that thinks that is wicked cool!" I also loved 105.3, Fresh Jamz in Tulsa. I always had the radio on and I pride myself on my usually length list of song lyrics I can recite by memory. I love all the famous DJ personalities! Except for Ryan Seacrest. Ryan Seacrest doesn't even love Ryan Seacrest... so my vitriol for him is understandable and totally reasonable. The internet opened up my access to some of these people and I loved to hear their stories, their opinions, and the music they played. I was always intrigued with the process of "being on the radio". I could only see some of my favorite personalities on TV, like when Donnie Simpson hosted BET Video Soul. It was fun to see these people be social, interact with their communities, and be such characters. Radio. It is, after all, the original form social media (tm). Which brings me to Tim & Jeff. Do you KNOW who these dudes are? and best of all- KIND. Here is thing about radio people: Some of them can be total douche bags, endlessly annoying *coughDELILAHcouh*, or completely out of touch with their listener demographics. Not Tim & Jeff. These gentlemen connect with their audience, interact with the community through fundraising and event promotion, and are really approachable. Qualities like these are what help a listener really connect. It is qualities like these that help me look passed the fact that hey Power 105.7, OHMYGAWDSTOPPLAYINGCARLEYRAEJEPSON! I have fallen in love with two white men. Their names are Tim & Jeff and they are quality people who are invested in Northwest Arkansas. The other day, I got to spend the morning with them, and although the topic of "skin tags" came up too many times, I had a GREAT time. We laughed and cut up and made fun of Honey Boo Boo. I got to see what they do, how they work, and how they gel as coworkers. Their craft involves skill and a really unique connection as teammates. This morning show is worth listening to. So tune in to Power 105.7, in Northwest Arkansas! Go like their Facebook Page, Follow Tim and Jeff on Twitter and listen in. (If you aren't local find them on this app). Who knows! You might hear yours truly every once in awhile. tags Jasmine, linky love, Memories, NWA, Stuff we LOVE! Farmer's Market Love and "All That Jazz" Recipe Challenge.